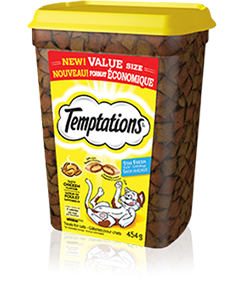 TEMPTATIONS® Tasty Chicken Flavour Treats for cats is formulated to meet the nutritional levels established by the AAFCO Cat food Nutrient Profiles for all life stages. AAFCO stands for the Association of American Feed Control Officials. AAFCO develops standards for dog and cat nutrient profiles which are used as model regulations in the United States. 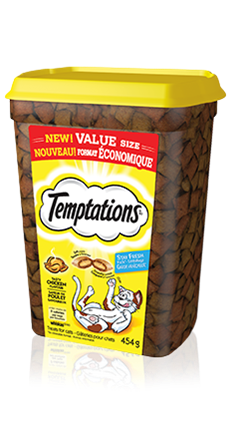 AAFCO feeding protocols are referenced the ""Guide for the Labeling and Advertising of Pet Foods"" endorsed by the Competition Bureau of Canada as well as in the Guidelines for the Canadian Pet Food Industry, developed and administered by the Pet Food Association of Canada. These documents were created to help pet food manufacturers ensure that the food that they manufacture, distribution and sale of animal feeds are safe and of high quality.